St. Petersburg - he was once Leningrad, a hero city, he is also the cultural capital of our Motherland, he is our "Venice". Stunning city, which simply fascinates with its beauty and its greatness. All those who have ever been here will certainly want to come back here again. This is not surprising. In the city mostly cloudy weather prevails, often it is cloudy, but also sunny days can be observed here. 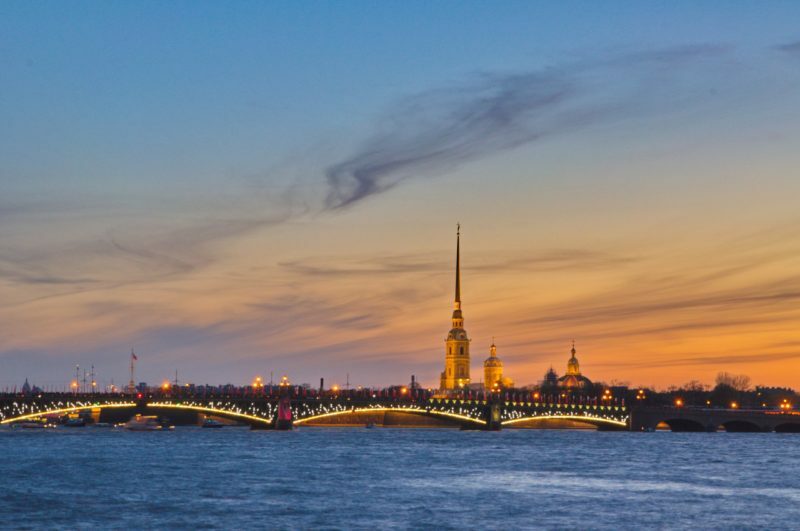 A famous feature that attracts many tourists every year are the "White Nights". They can be caught from the end of May to the middle of July. It is especially interesting to observe the divorce of bridges on such nights. It's just an inexpressible sight. Perhaps everyone should see this with their own eyes. Oh, how many offers "let's get married" heard these bridges! As a tourist object the city of St. Petersburg can show off with its unique architecture. The history of this city is directly traced in every building. These huge squares, on which you feel yourself in the epicenter of historical events, have the feeling that now the carriages and ladies will arrive in luxurious dresses will pass by you. An integral part of the architecture should be noted and objects such as parks and gardens. There are enough of them in Petersburg, all of them amaze with their scale. For example, the Summer Garden - it's just a great place to walk among the rich greenery, where you can sit on a stool, just relax from the city's bustle and dream about something. Also, the largest and most beautiful parks can be found in the suburbs of St. Petersburg, such as Peterhof, Tsarskoe Selo, Gatchina and others. In addition to parks in Peterhof, it will be impossible not to turn to the enormous number of beautiful fountains of Peter. I'm just crazy about them. Just to admire them is simply not possible. Amazed by the skill of those times, which as they say were built "for ages". The beautiful ensemble of the cascade bewitches with its brilliance. Distract from the fountains and pay attention to the palaces in these suburbs. It's just awesome. In each of them is visible this atmosphere of luxury, wealth, antiquity. The halls of the palaces are kept in perfect condition, with what pleases that half of this state is a direct merit of tourists-visitors who take care of history. I would like to draw your attention to the palace in Tsarskoye Selo, where the famous and unique Amber Room is kept. Special care is shown to her, this is the only room in the palace where photography and video shooting are prohibited to prevent damage to amber. What can I say about her? It is a masterpiece! It just dazzles you with the warm light of amber. Every room, every corner of every palace seems to be hurrying to tell you a story about what she has seen for so many centuries. I advise you to use the services of guides when visiting palaces, their story will be very informative and interesting for everyone. Having finished with the suburbs, I propose to go back to the city and continue our acquaintance with him. For connoisseurs and anyone interested in architecture, I also advise you to visit the following sites: the Kazan Cathedral, the "Zinger" Building, the famous Bankovy Bridge with its majestic lions, the Savior on Spilled Blood, the Peter and Paul Fortress, the Alexander Nevsky Lavra, the Palace Square with the Alexandria Column, the Admiralty, Isaakievsky Cathedral (for those who wish see the whole city, a very interesting sightseeing tour is held at the cathedral itself), which is located on Isaakievskaya Square. I would also like to celebrate with pleasure in such an amazing city its culture, namely historical and cultural sites. St. Petersburg is just a fount of all sorts of museums, galleries, theaters. I am sure that there is not a single person who has not heard about the Hermitage. Having visited there for the first time, I realized that I will not have a month, provided that I spend every day there to inspect all the halls and all the exhibits. Be sure to visit it. I was most noted there as a weapon room, the famous cuckoo clock and, of course, the picture of Leonardo himself. Be sure to not bypass the Russian Museum, because this is the largest museum of Russian art. In addition to the most famous museums you can find in the city and such funny museums as a museum of beer, a water museum, a museum of chocolate and others. If possible, visit the Mariinsky Theater, without fail, without a moment's hesitation, visit it! I'm sure you will not regret this in any way. Pleasantly tired after traversing all the sights, you can always find a place for every taste, where you can tasty and pleasantly relax, pampering yourself with anything. A lot of restaurants, cafes and other places literally beckon you to come and taste something from their menu. Do not miss this opportunity and reward yourself and your feet with a well-deserved rest, because you will have to walk a lot! Have a nice holiday in such a wonderful city and definitely visit it again!